P Madhavan will speak about his experimentation with alternative photography practices and share his experiences of the Altlab Photography Residency, a flagship programme of Goa Centre for Alternative Photography (Goa-CAP). Since its inception, Goa-CAP has organised exhibitions, residencies, workshops and photography dialogues, and engaged with educational institutions and student bodies to become a professional and comprehensive platform for the promotion of alternative photography in India. Early morning, 1973, close to the sea; the artist Ramanujam disappears into his drawing, after turning into a black dog. Many speculations follow, on images, immortality and dreams—A Gathering at the Carnival Shop, attempts to recapture this imaginative space. Ramanujam lived and worked at the Cholamandal Artists' Village in Chennai, situated along the south-eastern coast of India. The Village sought to bring together community living and contemporary art for the first time in the country. The realisation of a radical dream, it was set up in 1966 by a group of young artists from The Madras College of Art, under the guidance of their facilitator, K C S Panicker. 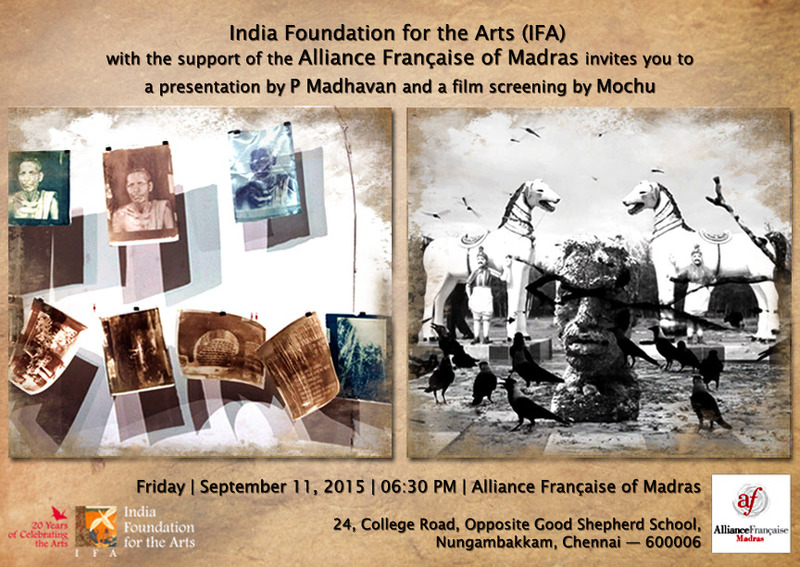 The work produced by the artists significantly contributed to The Madras Movement of Art. Madhavan is a photographer and the Executive Director of Goa Centre for Alternative Photography (Goa-CAP). Mochu is a filmmaker and artist, trained in film and video from the National Institute of Design (NID), Ahmedabad. Mochu received a grant for his project from IFA under its Arts Research and Documentation Programme and Goa-CAP was set up with support from IFA under its Extending Arts Practice Programme.